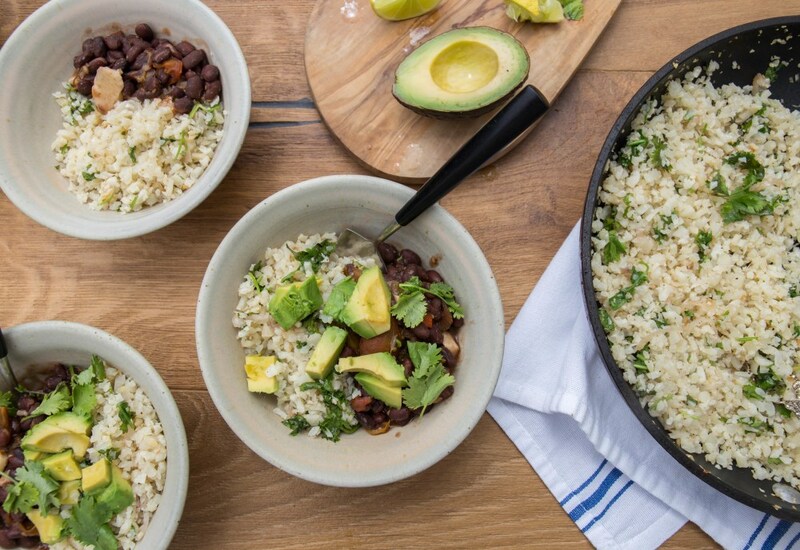 Spiced black beans and homemade cauliflower rice come together in this healthier take on the traditional Latin American side dish. Cauliflower rice is super simple to make at home with the help of a food processor, and is a great grain-free and low-carb alternative to rice, plus it's loaded with vitamins and minerals. Using canned black beans means this dish comes together in under 30 minutes. Eat the rice and beans with some diced avocado and a poached egg for an easy vegetarian dinner, or serve alongside tacos or fajitas as a nutritious, delicious side. For a more filling meal, make cauliflower rice burrito bowls! Cook up a batch of sautéed peppers and onions, grilled chicken, steak or pulled pork. Serve with guacamole, pickled red onions, sour cream and pico de gallo for an easily customizable lunch or dinner. Per Serving: 548 calories; 5g fat; 95.2g carbohydrates; 34g protein; 0mg cholesterol; 2849mg sodium. Simple, great recipe. Perfect for healthy weeknight dinner. The beans are soo filling, don't be intimidated by no meat if you are a meat-eater. It'll fill you up! Love the cumin in the black beans! In past recipes I haven't used that and with this recipe it definitely rounded out the flavors nicely! Serve with salsa, avocado, and sour cream and this combination can't be beat! Yum! I got tired of plain cauliflower rice, but eating it with beans like a traditional Dominican moro (or rice and beans) tastes fantastic. I skipped the tomatoes, but overall great recipe! I really enjoyed this. While the beans were cooking I actually used my pressure cooker to make cauliflower rice! Next time I'll have to try the cauliflower rice burrito bowl, that sounds really good. I was able to get two, large servings from this recipe. Next time I'll probably use two cauliflower heads for the rice.